I realize that I am dating myself with the following question - how many of you remember playing the electronic memory game "Simon" growing up? Thanks to a tip from one of our FB followers, I discovered a FREE Simon like app (Simon Says) which has quickly become a favorite of my daughter. She had suggested on more than one occasion how much fun it would be if we could create a "life sized" version. 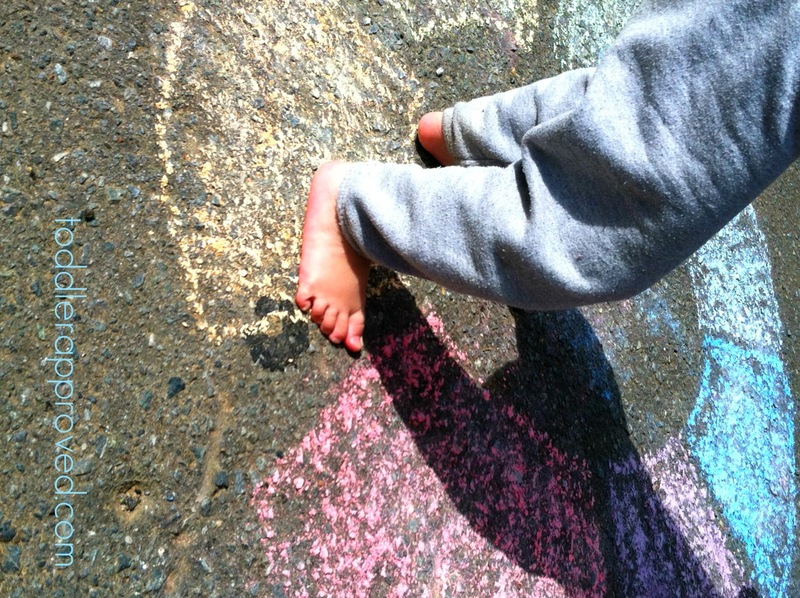 Earlier this week, we did just that thanks to some rainbow colored chalk (and above average temperatures). The original Simon game includes for sections colored: red, blue, yellow, green. We decided to make ours the colors of the rainbow (red, orange, yellow, green, blue, indigo, violet) in honor of St. Patrick's Day. Have your child start by standing in the center of the "game board". Begin by saying a color ("red"). The child will jump to that color and then back to the center. Say the first color and add another ("red, yellow"). 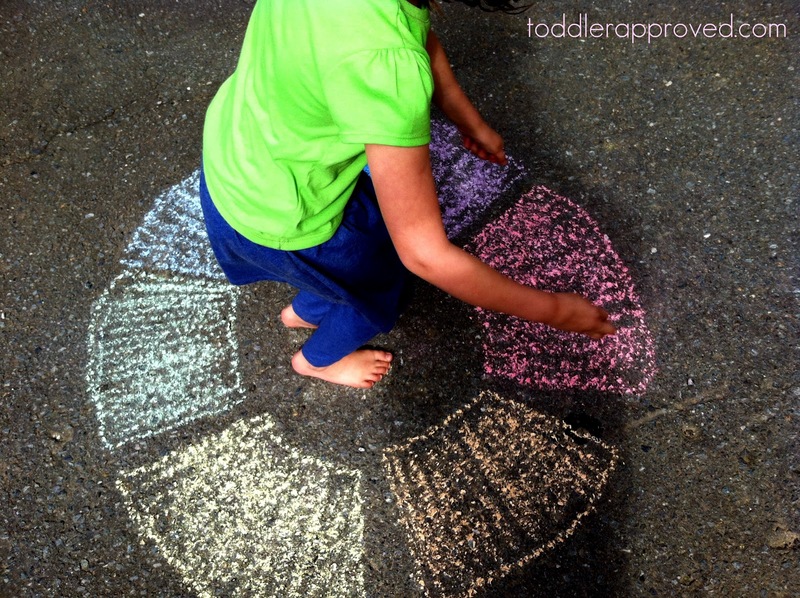 The child will jump to the first color (red), next color (yellow) and then back to the center. Keep adding one color until you have 6-8 in the sequence. 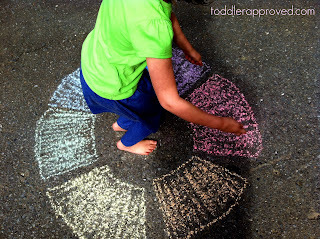 Not only was this a fun and active way to practice saying and recognizing the colors of the rainbow, but a great memory building activity as well. This is fantastic! 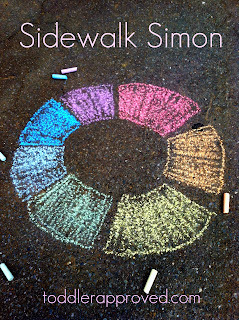 What a fun way to learn about the colors, build memory skills, and play with an inexpensive Simon board. Great idea. Oooh you ARE clever! What a fabulous way to play the Simple Simon game. Fantastic! Great idea!!! Used to LOVE Simon!!! I LOVED that game back in the day! What a complete flash back. I also downloaded the Simon Says game and my son has had so much fun with it. We're going to try your real life version this weekend. I've featured you on my blog today as one of my favourites from last week's Weekly Kid's Co-Op link up. Can't wait to try! Thanks for sharing! I was perusing the web, looking for great outdoor activities to share with the pediatric therapy professionals we serve, and found your sidewalk simon. Its awesome! I was wondering if I could have permission to feature the photo on our Instagram feed. Hi Heidi, at this time I would prefer for Pediastaff not to use my images on Instagram until clickable links are available. Thanks so much for asking! When I was young we played Simon Says without any electronic gadgets. It was all just listening to the person who was "Simon"
Yep, I did growing up too and still do with my kids. This activity wasn't related to Simon Says, but rather the color game Simon. Simon Says is a great game for kids though!